Everyone has heard about the Finnish education system and world's best PISA results, but do you know which country has the most heavy metal bands per capita or drinks the most coffee? Finland is a tiny country in the northernmost corner of Europe - in fact, along with Iceland it is the only country located almost completely north of the 60th latitude. It's five and half million inhabitants could easily fit into one of the suburbs of New York or Shanghai. Finns engaged in wife carrying, one of the local sports. The Corruption Perception Index is considered the "gold standard for determining corruption worldwide". In it's 2012 results, Finland, Denmark and New Zealand shared the top spot. In reflecting on the reasons for this apparent lack of corruption, Business Insider notes that all these countries "have high GDP per capita, low inequality rates, literacy rates close to 100 press, and prioritize human right issues such as gender equality and freedom of information." Low corruption, that's a good way to start! The graphs don't lie. Finland has the most heavy metal bands per capita in the world. The dark winter surely plays a major role in this attachment to suicidal lyrics, double bass drum, and the color black: the Nordic countries are the clear winners of this genre. But even in this crowd, Finland stands apart. While Sweden and Norway have only 27 heavy metal bands per 100.000 inhabitants, Finland boasts double as much, 54 bands per 100.000. A metal band in every village! If you don't know what heavy metal or death metal sounds like, start with Children of Bodom, a Finnish band named after a famous massacre that took place on the quiet shores of the Lake Bodom. As mentioned, the PISA rankings put Finland as number one in at least one of the categories of Science, Reading and Mathematics every time from 2000 to 2006. Because of this, even today it is impossible to read an article in New York Times about education, without somebody mentioning Finland as an example. This despite the fact, that in the latest Pisa results East Asian countries have taken the lead and Finland is pushed down to 5th place in Science and 12th place in Math. But this is not the end of the story. In 2012 Pearson combined results from a number of different studies to announce that Finland still has the best overall education system in the world. How do you survive days when the sun peeks from the horizon for a few hours, before dropping back towards the more blessed countries in the south? What do you do when it is freezing cold and completely dark outside, and you feel that you can't get out of the bed to face the harsh reality? The answer: You drink coffee. While the annual world average of coffee consumption is 1.3 kg per person, the average Finnish person likes to indulge plenty of cups per day to consume 12 kg of coffee per year. The harsh winter is not so harsh when you are constantly high on caffeine. Some countries fail. Think of Somalia, Congo, and Sudan, where the government controls only a tiny fraction of the country, while the rest is in various states of anarchy and tribal warfare. Some other countries don't fail. And among these, Finland is the global leader. Fund for Peace ranks state failure by various indicators including lack of practical control over territory, non-provision of public services and widespread corruption and criminality. From one end of the index we find countries that are completely malfunctional. From the other end of the index we find Finland, which thus can be said to be the most stable country in the world (pending Russian invasion). This is a category where Finland truly sets itself apart from the rest of the world. We are the unquestioned champions of sauna! Think about it: 3.3 million saunas for 5.3 million people. More than one sauna for every other citizen. Take a family of five, include the babies and the grandparents, and they are prone to have at least three saunas. There are saunas everywhere in Finland: Every newer apartment is equipped with a sauna, all hotels, gyms and office buildings have them. Even foreigners living in Finland can't escape them: Bruce Oreck, the former bodybuilder and current US Ambassador in Finland admits going to sauna at least once per week. As a member of the Finnish Sauna Society and as the guy who had a sauna in his 33-square meter (355 square feet) student apartment, this is an accomplishment I am personally especially proud of. To learn more about Finnish sauna culture, and why sauna is considered the everyman's church in Finland, read this excellent article from BBC. For the last 14 years, Save the Children has been ranking countries based on how good places they are for mothers. And the current leader is Finland. The low lifetime risk for maternal death (1 in 12.200 is five times better than the US death rate of 1 in 2.400) and the amount of women in national government (42.5% as compared to US 18.2%) are some of the criteria that land Finland to the number one position as the place to give birth and raise a family. What do Finnish people drink? Beer and vodka might be the first images that come to mind. But alas, Finland is only 11th in beer consumption around the world, and much "worse" in spirit consumption. But when it comes to milk, Finnish people consume 1 liter per day per person (0.26 gallons) outranking its rival Sweden to claim the top spot around the world. If you are wondering why Finnish mothers are so strong, the reason is the heavy milk packages they have to carry home every day to satisfy the children's endless thirst for more of this white gold. When Monocle investigated cities of the world to find the most livable, Helsinki, the capital of Finland, emerged as number one. According to the Monocle, "the Finnish capital stands out for its fundamental courage to rethink its urban ambitions, and for possessing the talent, ideas and guts to pull it off." Helsinki has indeed changed quite much from those not-so-far-away-days when one could only buy alcohol when one ordered a meal. As a guy who has poured his fair share of euros into keeping the small bars of Helsinki alive, I can just say: cool! Reader's Digest decided to drop 192 wallets into 16 different cities from New York to Mumbai to see how many of them would be returned. In every city 12 wallets were dropped and in Lisbon, Portugal, only one of the wallets was returned - by a couple on holiday from Holland. Compare this with Helsinki, the winner of the experiment, where 11 wallets out of 12 were returned making the capital of Finland the most honest city in the world. P.S. If you thought that honesty is an effect of how rich or poor a country is, think again: Number two, with 9 wallets returned, was Mumbai in India, which beat, for example, New York (8 wallets returned), Berlin (6 wallets returned) and London (5 wallets returned). 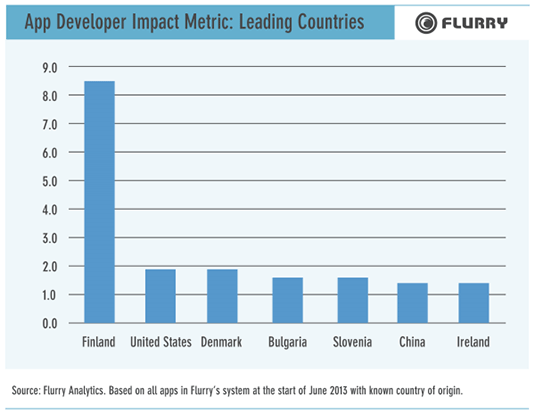 Well, best is always a matter of taste, but Finnish mobile games are the most successful. Supercell made recently history by holding the #1 and #2 positions as the top grossing US iPad and iPhone apps. Other recent Finnish apps hitting the top position in downloads or revenue include Badlands and Oceanhorn. In a recent chart, three Finnish companies held together more Top 5 positions in iPad charts than all US vendors combined. Not bad for a country of five million people, and surely the most hit games per capita any country has ever produced. And then there is Angry Birds, the most famous Finnish product since the Nokia phones. Get this: Recently Rovio, the company behind Angry Birds, announced that the downloads for their flagship game had surpassed two billions. Two billions! To put that number in perspective, consider that Michael Jackson's Thriller, the best-selling album of all times, has sold around 60 million copies worldwide. This means that there are over 30 times more Angry Birds in mobile phones around the world than there are copies of Thriller. No wonder Ben Rooney from the Wall Street Journal was forced to ask: "Is Angry Birds bigger than Mickey Mouse?" In New York people borrow on average 8 books per capita per year. In Berlin the number is 6.8, in London 4.8, in Paris 4, in Shanghai 2.5, and in Rio de Janeiro 0.03. In Finland, however, the number is 18 per capita. That means that a family of five borrowing 100 books during one year is nothing unusual. In fact it is the norm rather than the exception. Reliable international comparisons are lacking, but until somebody comes to challenge the Finnish number of 18 per capita, I am ready to crown Finland as the country with the most used public libraries. The above listing includes only things where Finland really is the number one in the world. In addition, there are many listings where Finland is almost at the top, but not quite there. For example, according to World Happiness Report, Finland is the second happiest country in the world after Denmark. It is perhaps not a coincidence that in consuming candy, Finland lands the top ten with Denmark again leading the pack. On the other side of the scale, Finland is the country that eats least fruits on a daily basis. More candy, less fruits, is that the secret behind it all? But it is not only happy happy joy joy - even serious business loves Finland: In the Global Competitiveness Index, Finland occupies the third position, after Switzerland and Singapore. When World Economic Forum ranked countries according to how good work force they have, Finland had second best workers in the world, right after Switzerland. Finland is also the most forested land in Europe with forests covering 75 % of Finland's land area. And along with its Nordic neighbors it tops the world in newspaper reading. In gender equality World Economic Forum ranks Finland as second best in the world after Iceland, but before Norway and Sweden who take up the next places. What to make of this all? The least we can say, to quote general Adolf Ehrnrooth, is that "Finland is a good country. The best country for us Finns." But perhaps not only for Finns. When Newsweek in 2010 ranked the countries of the world along a large number of criteria, they boldly declared one country to be the best in the world. Guess which? Finland.